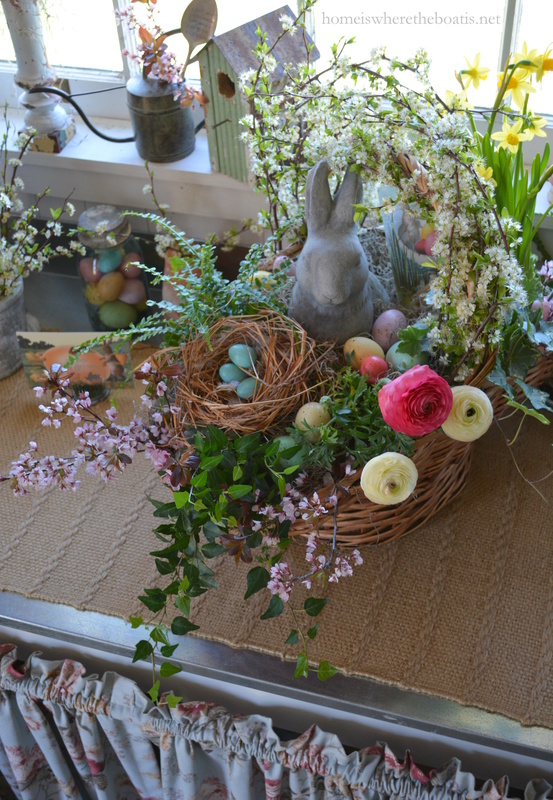 I have a Blooming Easter Basket DIY for your Easter table or a kitchen island if you’re dining buffet-style! 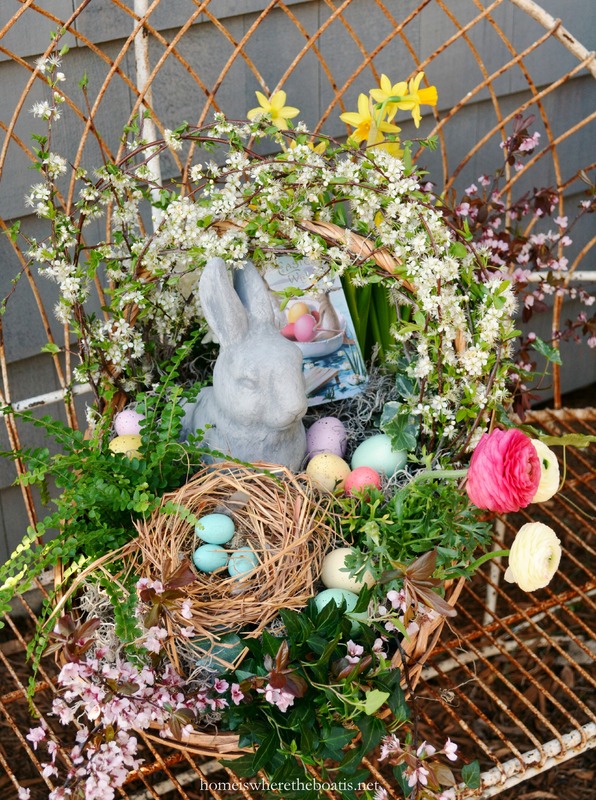 You can build a Blooming Easter Basket in about an hour once you’ve gathered and have all your supplies on hand! 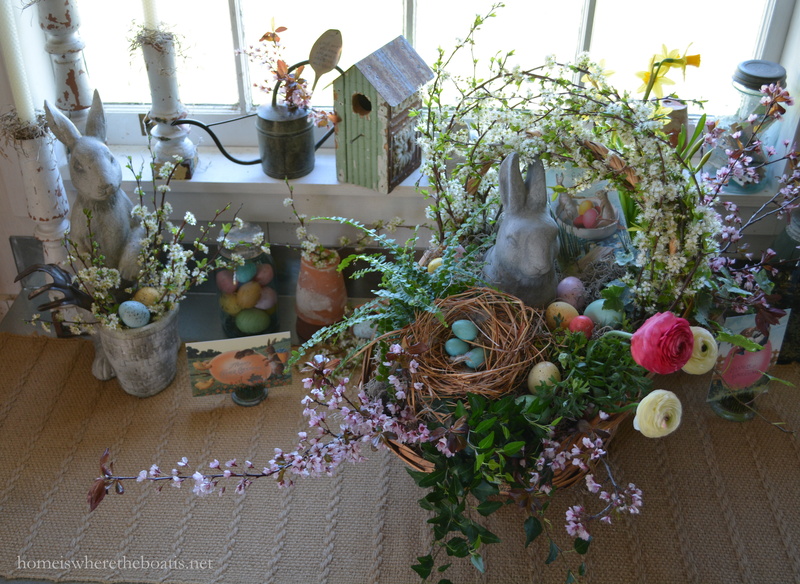 I used pots of ivy, daffodils, ranunculus and fern for the basket to join a bunny nesting among the Easter eggs! I found my flowers in the garden center at Walmart but the grocery store is convenient and great source for flowers, especially around Easter, with pots of azaleas, hydrangeas, and bulbs that you can enjoy indoors and plant in your garden once they’ve finished blooming. I cut some wild plum blossoms for the handle of the basket. You could use forsythia, cherry, spirea or even fresh, spring green branches. Cut your stems or branches long enough to wind at least 2/3 the way of the length of the handle, winding the stems both directions from the ends of the basket. Younger green stems/branches are easier to wrap around your basket handle than older, woody ones. 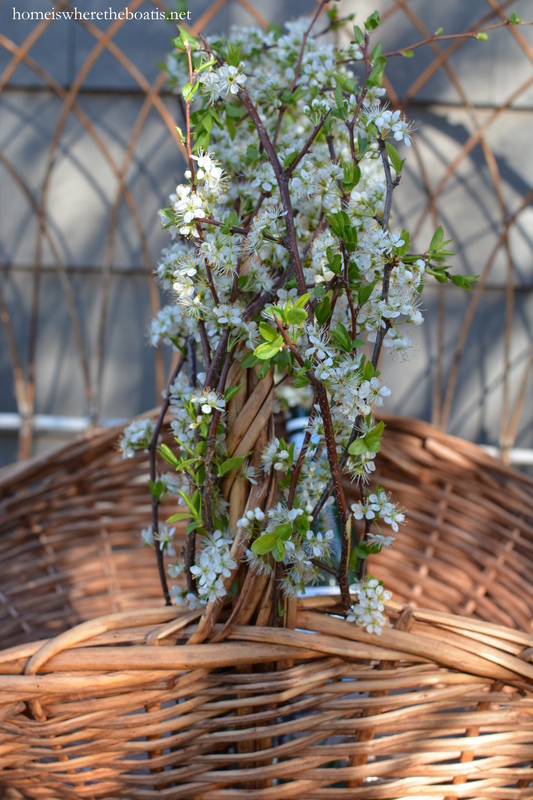 Bridal Wreath Spirea is my favorite to use on a basket handle since the new growth is supple and it has a cascade of flowers, but ours hasn’t bloomed yet this spring. I filled empty plastic bottles with water and tucked them inside the basket, inserting the ends of the branches in the bottle to help keep them fresh as long as possible. I lined the bottom my basket with plastic and used some empty grocery bags filled with newspaper to elevate the pots in basket. The plastic bags I used were brown so they would blend with the basket and would be less obvious showing through the weave of the basket. Water all your pots thoroughly before building your basket, placing your pots and arranging them until you have them how you like them. 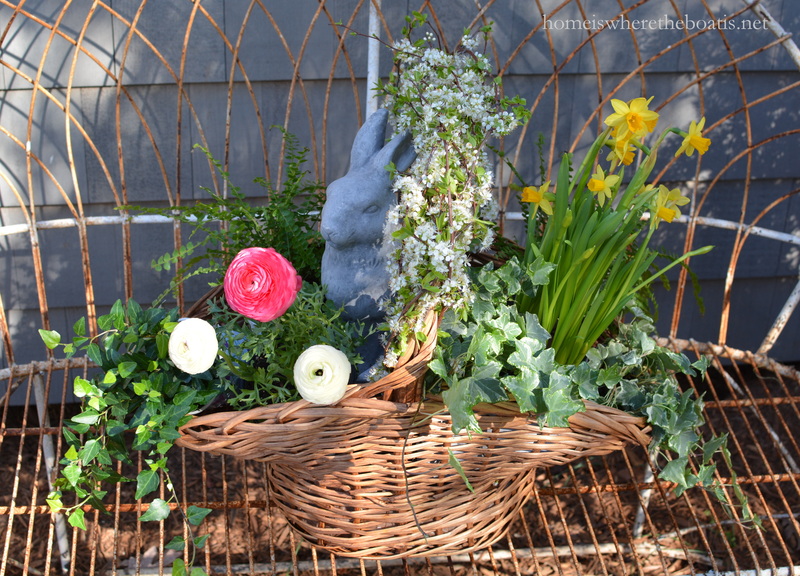 I used ivy to trail and spill over the sides of the basket and taller daffodils and flowers in the center. If you find all your pots don’t all fit, take your plants out of their pots and put them in a plastic bag, tucking them next to each other so they fit and fill the space in your basket. 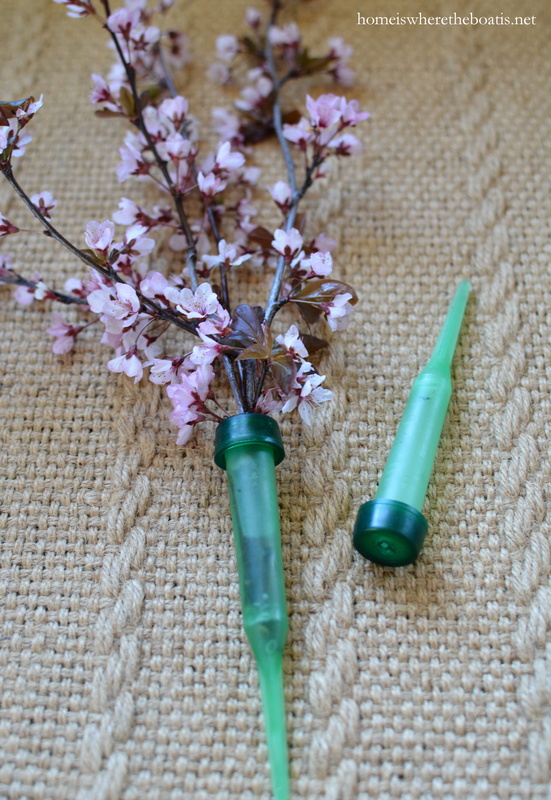 You can add single blooms or stems using floral water picks. You can find them on the floral aisle of the craft store in a package of 10 -12 for around $3.00. 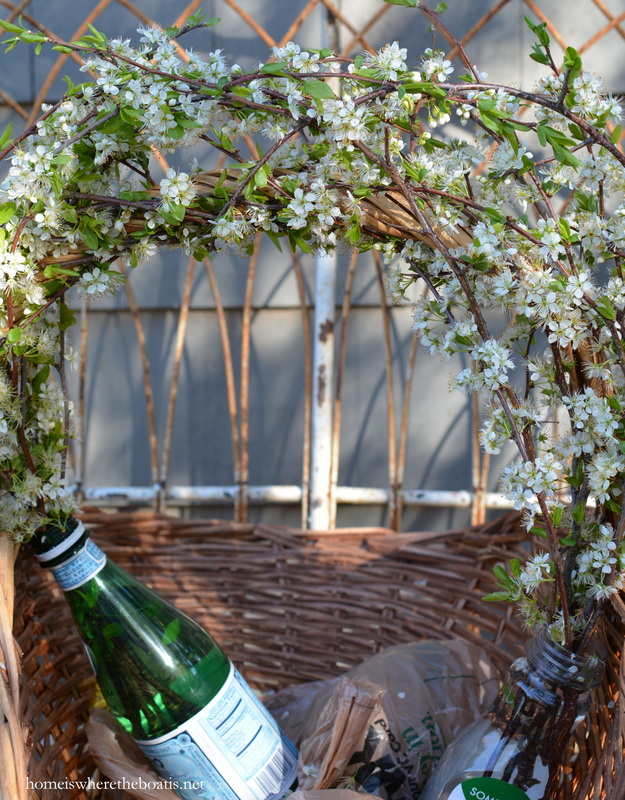 For a pop of pink, I added some purple leaf plum stems inserted in water picks to tuck in the basket. Once you have everything arranged, add moss to your basket to camouflage your pots. I filled in the extra space in the moss with colored eggs, a bird nest and a bunny. The bunny hopped in the basket first and placed the plants around him. He’s elevated on an empty overturned pot. 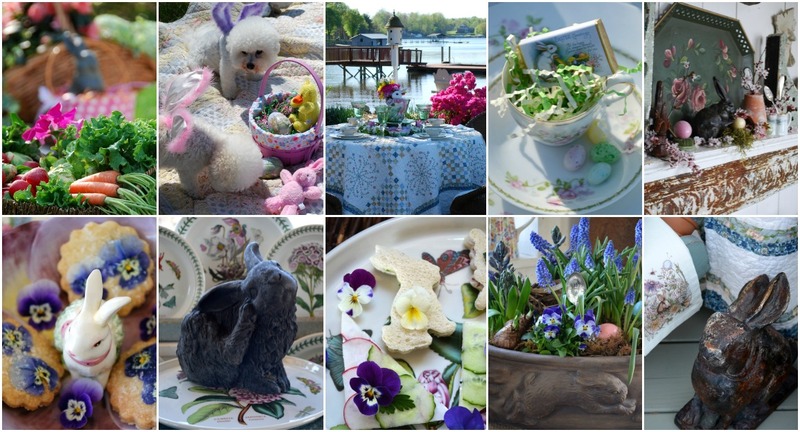 You can hop over and find other blooming Easter basket inspiration at the links below. 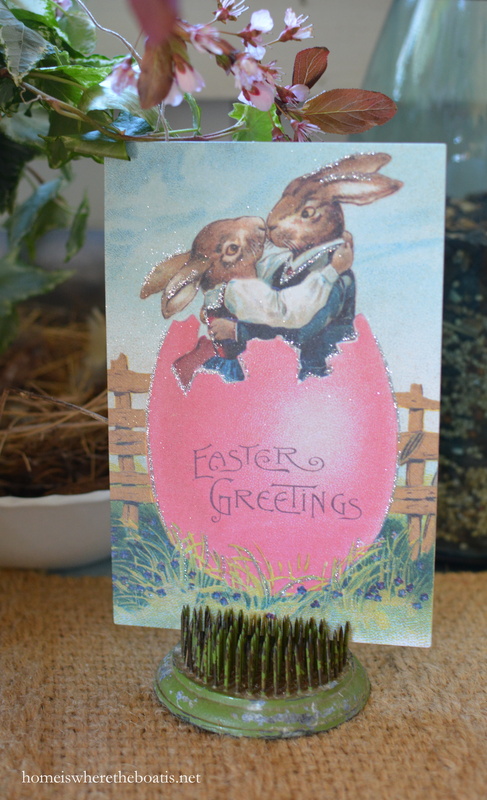 Sending you Easter Greetings. . .
from Our Boat to Yours! Very beautiful Easter basket. thanks so much for the DIY on how to make it. So lovely! I am very lucky that everything is blooming in my yard and surrounding woods. I will definitely give it a go. Look forward to your blog everyday. This is beautiful. Thank you so much for the great ideas. 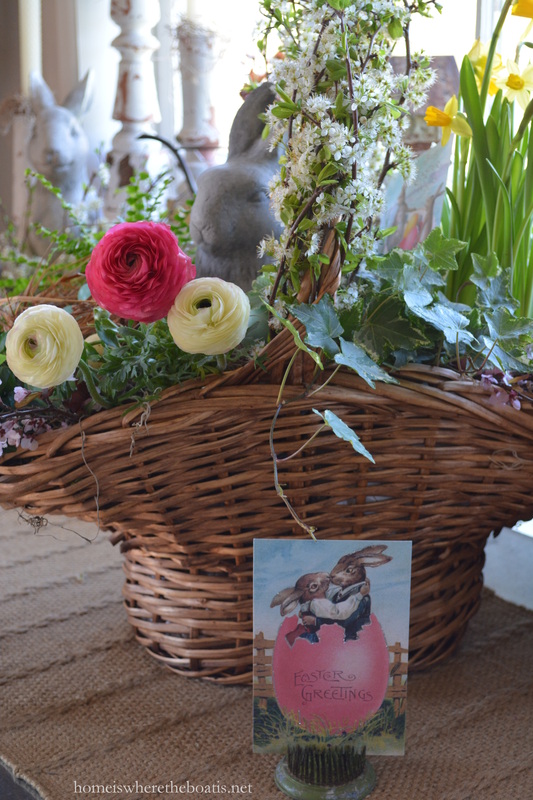 What a gorgeous Easter basket, Thanks for sharing with us. What a gorgeous idea,Mary. I’ve been thinking about what to do for my dining room table. Your idea is just perfect. 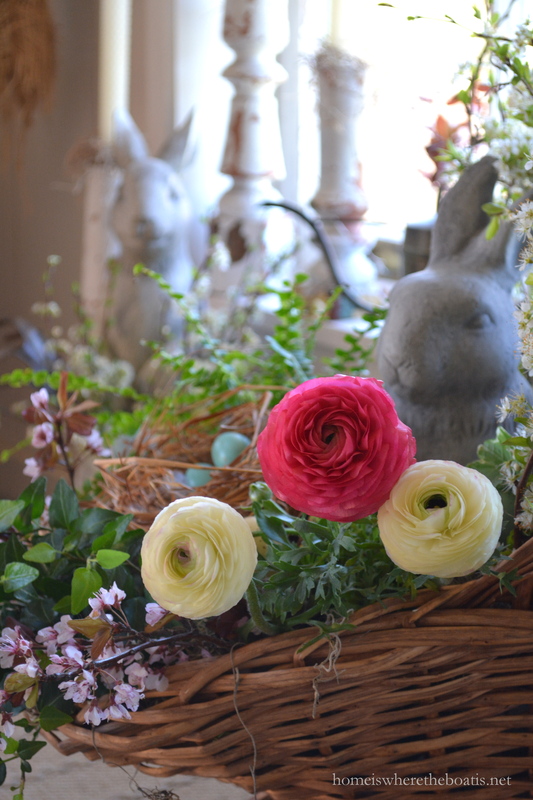 I have a bunny and a birds nest, just need to shop for the flowers. Thank you for the tutorial on how to pull it all together. Have a blessed Easter to you and your family! Oh my gosh, this is absolutely gorgeous!! I could never make it myself! But can sure drool over this one!! Thank you for sharing all these great tips! Best Easter basket ever Mary! So utterly charming, and all of your great tips~the water bottles for the stems wrapping the handle, and removing the plants from the pots and putting them in bags to fit, all so clever and brilliant as usual! 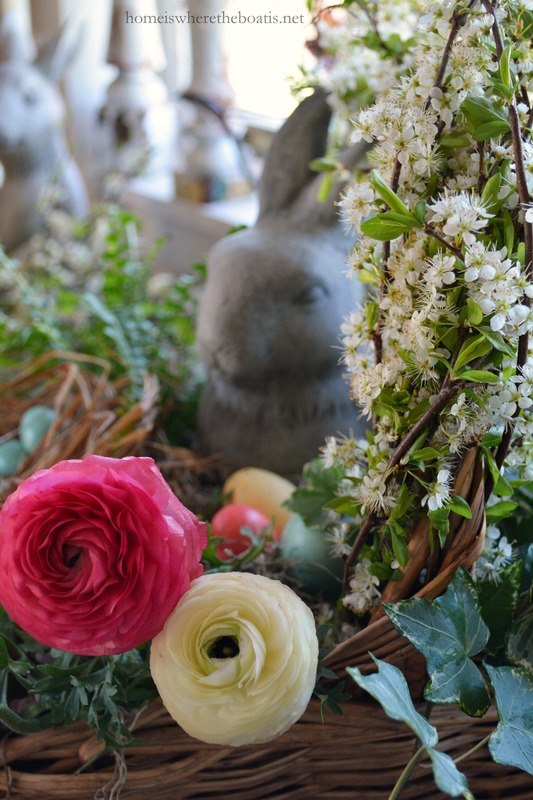 Your potting shed is certainly The place to be for Easter fun! Love the cards in the flower frogs too~ the blooming stems on the basket handle are just fabulous! Mary, What a nice job, such lovely baskets! Thanks for sharing, especially the water pick idea! So pretty!! Thanks for the tutorial! That is gorgeous, Mary! Love the vintage postcards too. You have me yearning for home, went back for a few hours over the weekend, the scents and sights were dazzling, your basket is a gorgeous reminder of all I leave behind… helping a friend do 3 tables for her coastal Easter, we are marching to town this early morn to make our own hefty baskets, it kills me to shop for beauty when there is nothing I am lacking at home, but hey, it’s not my wallet! Love LOVE LOVE yours, so up my garden alley, especially the blossomed handle. You are brilliant putting them in water, I just wove mine fresh for a shorter window. Your garden bench never looked so inviting! This has to be on the Top Ten list of my favorite creations by Mary! Utterly charming! Thank you for sharing your secrets, too! So, so lovely! How I wish I was not in this arm sling recovering from rotator cuff surgery and now with physical therapy ouch !! I didn’t even get my Easter baskets out :( . So “”thank you” for sharing your lovely Easter basket !! and of course everything you do is wonderful !! Have a blessed Easter . Wow, I love wht you did with your Easter basket, it is gorgeous! Thank you for sharing your creativity with us. 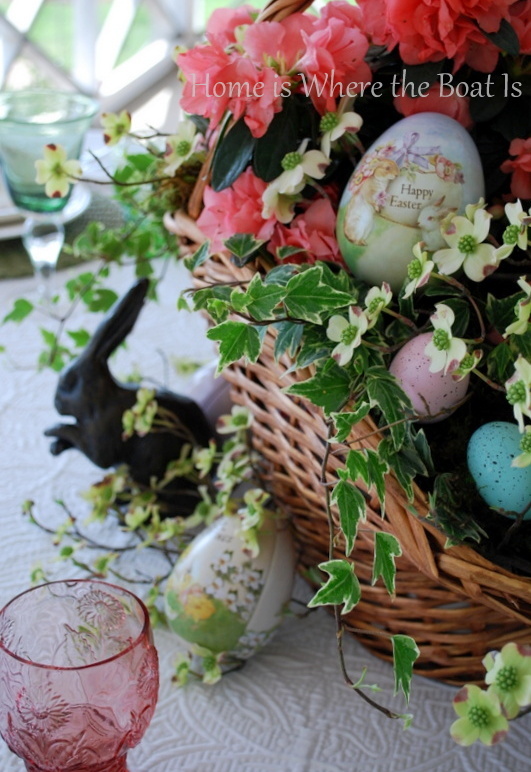 I don’t have the budget to decorate like this but, if I did, I would recreate this beautiful Easter basket. You photos are beautiful. I spied a blue hydranga bunny in your pics. HOW SWEET! Oh Mary, your basket is so bloomin’ cute! Thanks for the great tutorial on how to put it all together. The handle of flowery stems is just so lovely. 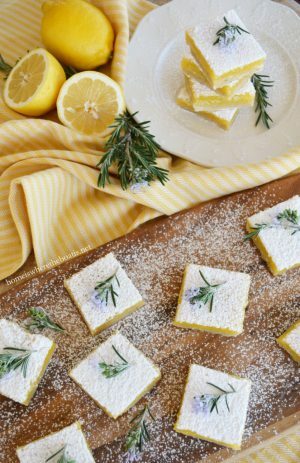 I would love to try my hand at this! Beautiful, Thanks for sharing. About how long will it last? Happy Easter to you as well! Your blog has become my morning enjoyment…gets my day off to a sunny start no matter the weather! Thank you! I saw the email come thru and I was in a meeting….couldn’t wait to get back to my desk to check out this post. What a beautiful basket!!! I have a new potting shed, still working on the interior….this post makes me very anxious to get it finished!!! Happy Easter Mary! Went back and looked at all the baskets–really fun! What an eggscellent idea for an Easter basket and so creative and lovely. 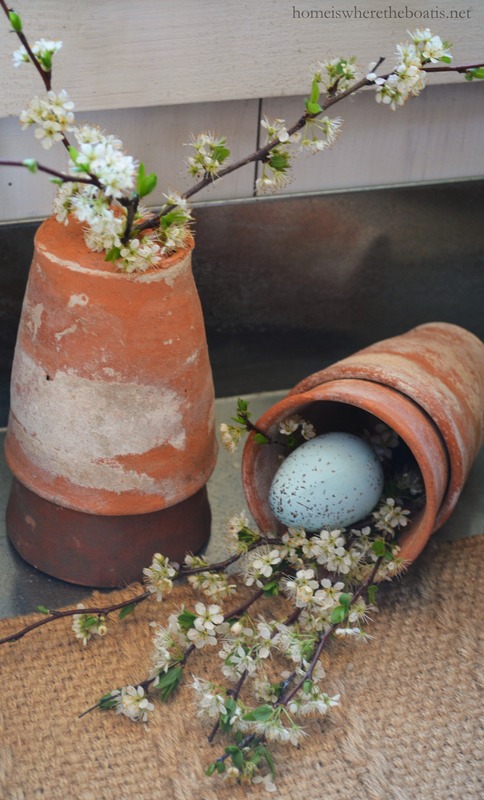 Love your pictures of the Easter decorations in your potting shed. 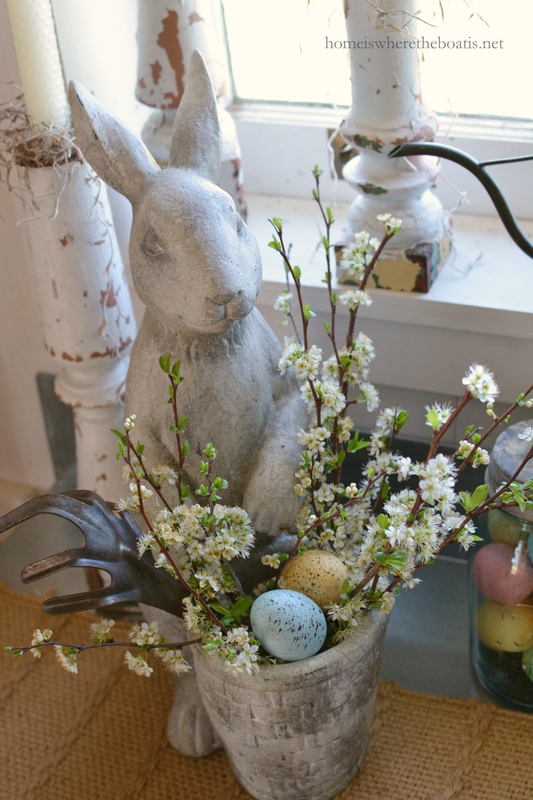 What an amazing and beautiful blog entry, love all your ideas, love Easter time very much too. Thanks for all your lovely ideas. Your blooming basket is spectacular. 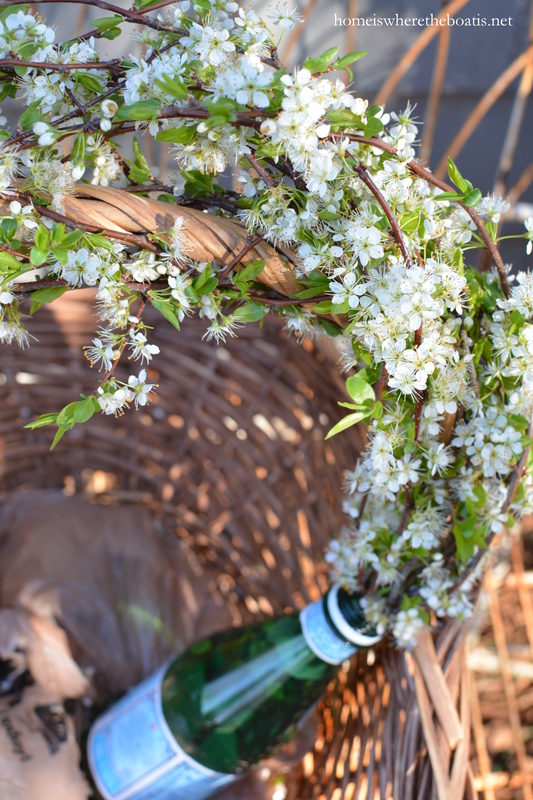 I love the idea of weaving the stems with blooms on the handle, and very clever of you to add the bottle of water. Smiling over this delightful mix. 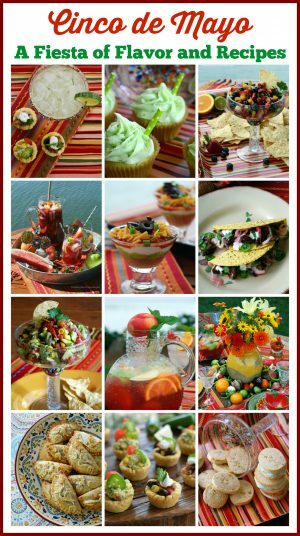 Makes me want to make one for our table. I need to have a party! Mary, These are gorgeous! LOVE them all. Thanks for the reminder about the floral water picks. I remembered that I only have two left, and thanks most of all for the inspiration. Happy Easter! 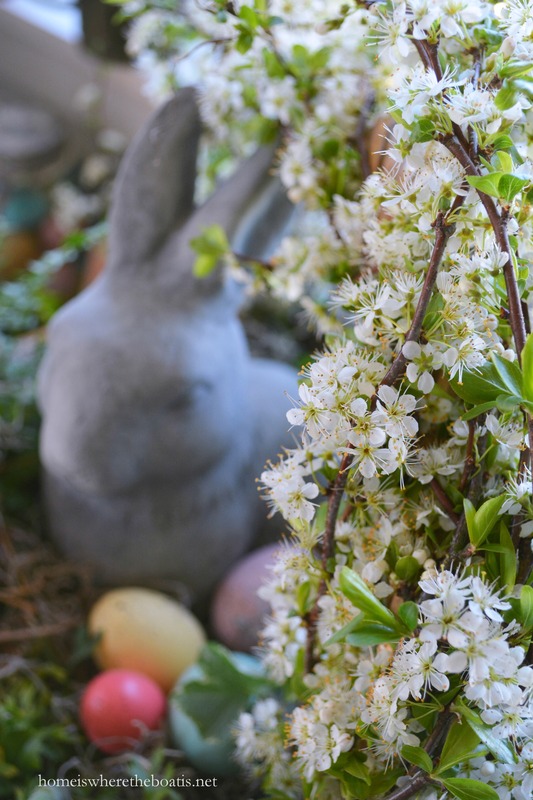 You have inspired me to make a blooming Easter basket!…Your basket is breathtaking….and what a great idea of usin the sparkling water bottles as “vases” for the blooming plum branches!….you have also reminded me that I want to make a “hydrangea bunny”….Have a great Easter Mary!! !…Will we see the girls with bunny ears soon? How very pretty Mary. May have to give this a try. Thanks for showing us how. Have a blessed Easter! That is one really beautiful basket! 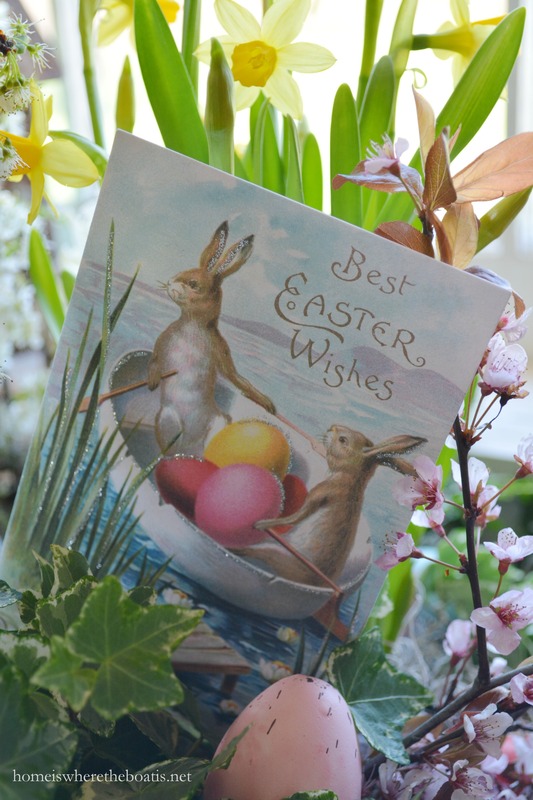 Hope you have a lovely Easter! Just BEAUTIFUL. 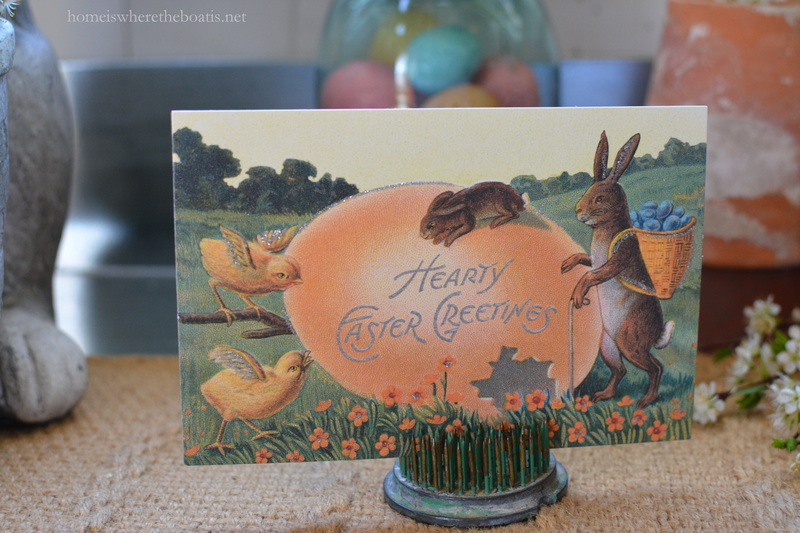 And WOW, how befitting the bunnies in their boat. I just LOVE that vintage card. Fantastic as always! Great way to build basket with real plants. Love the pots with the branches too! Just the prettiest idea! Love using live plants. Pretty ,as everything you do is. Thanksfor the how to, especially the brown bag tip. Gorgeous, just as all your projects are! Just beautiful!! I never would have thought to place bottles of water down in a basket! Thanks for the tips on how you created this gorgeous basket. 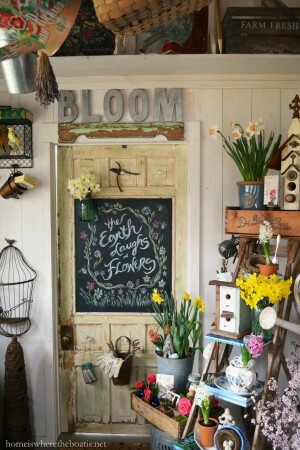 Your potting shed is a little piece of heaven on earth! I think that is the prettiest Easter basket I have ever seen! Thank you so much for bringing me to my happy place :-). The only thing blooming here is snow, but the sun is shining and melting it away. 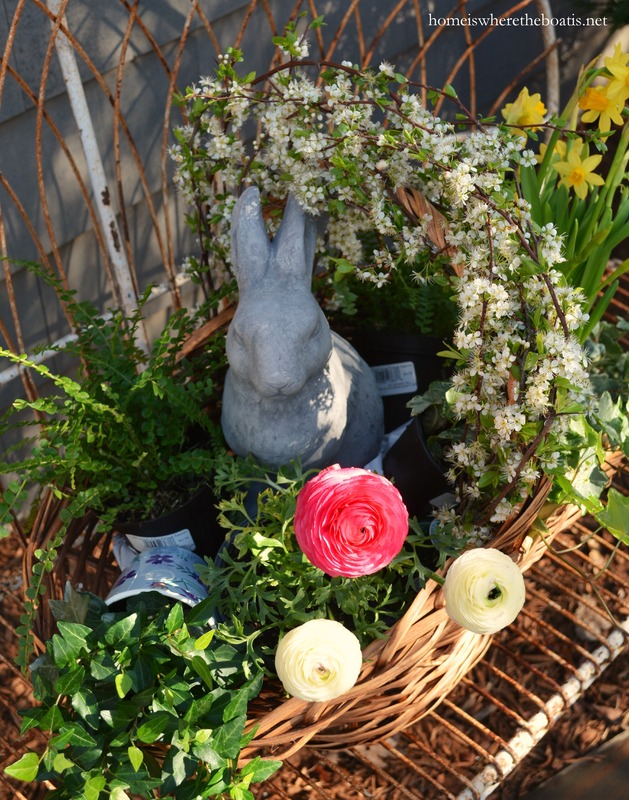 A trip to our local garden center and the smell of plants and dirt will give me inspiration to adorn my Easter basket. Daylight Savings this coming weekend. Yay!!!! 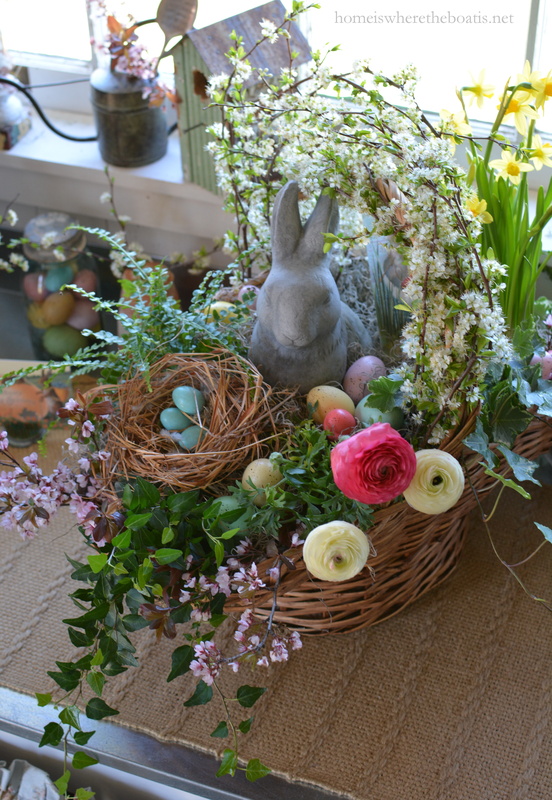 Mary, this basket is stunning…and your step by step and ideas will make it very do-able. I’m excited to put one together as I actually have a large basket to use! Thanks for the inspiration. That was a visual feast for the eyes. Thank you! OMG your one amazingly talented lady! What a cute idea and so beautiful! I’ve got two nice big baskets that I just took out because I was tired of them. They just sat around holding magazines so now I have a better purpose for them. I wish I had your green thumb as well but I don’t so I may do my baskets with silk flowers instead. Sorry! 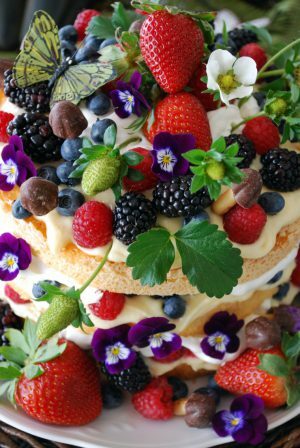 I love all the things you’ve made on your website so I signed up and can hardly wait to see what other amazing things you come up with, Have a great Easter! Beautiful baskets and so many good tips on constructing it so fresh plants stay watered and other items “elevated”. I will be trying some of these things in future arrangements. I use plastic bags all the time for liners, but I never thought to fill them with newspaper to add additional bulk. Thanks for your ideas!